Despite a few limitations, the KB37 is a very tempting proposition for new-to-computer-recording guitarists to consider. Decent keyboard. Great sounds. Quality audio interface. Covers all bases. Hands-on control of software amp parameters. Can’t use software as a plug-in. Only one velocity curve option. Could use a couple more rotary controllers. For many recording guitarists, the keyboard is a necessary evil. Conscious of this, Line 6 have created the KB37 -- a controller keyboard and audio interface that comes cunningly disguised as a piece of 1960s studio-ware. The flowing retro lines draw your fingers to the control surface and the build quality is very good. The plastic casing offers a resilience that belies its light weight and the rotary controls operate smoothly, while offering the right amount of resistance. The three octaves of keys have a smooth ‘synth´ action and feature a single, middle-of-the-road velocity curve that gives decent playability of most instruments. It´s a shame that no alternative curves are offered, however. The range is expanded by the Octave Select buttons, offering three octaves up/down. 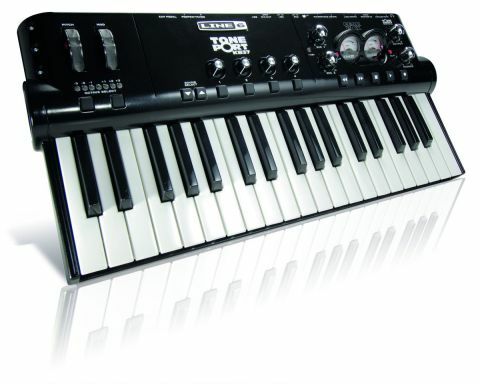 The audio interface element of the KB37 is similar in functionality to that of the Line 6 UX2. Two microphone inputs are provided (with phantom power) as well as two line inputs, a stereo monitor input, an expression pedal, two footswitch inputs and an instrument input complete with pad. In the other direction, there are two analogue outs and S/PDIF stereo out. Also onboard are two bona fide VU meters. These indicate input, send, monitor or output levels depending on what you select in the software. Guitar tone generation is handled by Line 6´s GearBox software. This version is standalone, though you can pay to upgrade if you want plug-in functionality. Included are 18 guitar amp, five bass amp, six preamp and 30 effect models. Plenty more can be bought as add-ons from the Line 6 website. The models sound sublime -- some truly breathtaking sounds can be found in the presets alone. From a production point of view, all bases are covered, with the mic preamp models being a particularly excellent resource. The KB37 is a great multitasker, coming in handy for guitar, bass, vocal and keyboard recordings. What´s more, its compact size and light weight make it ideal for carting around with a laptop. If the KB37 came with the plug-in version of GearBox, it would receive very high marks. As it stands, however, there´s no way of altering sounds once they´re recorded -- a major drawback. Redemption, however, comes in the form of incredible ease of use and very high quality sounds, and these features ensure that the KB37 emerges as another fine Line 6 product.